The Hub Washington provides flexible office space and business support services for SME’s in the North East of England. Located less than two minutes’ drive from the A1, The Hub consists of two floors and 17 modern, air-conditioned offices providing meeting space, conference facilities as well as advice and support to start up and established businesses. Offices range from 150sq.ft. up to 1,000sq.ft. Managed by BIC Space, our experienced advisers help hundreds of new businesses to start up each year by providing one-to-one business advice, mentoring and support, training courses, workshops and seminars. 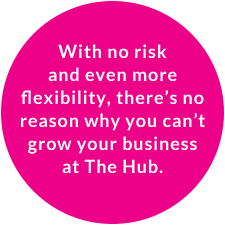 Whatever your needs and whatever stage of development your business is at, The Hub is here to help. Request a callback or call 0191 338 5166 to speak to an adviser.